As we set off from sleepy Papnat in the the searing heat, we passed flourishing market gardens, animals laying sedately under the canopy of trees and the occasional car with tourists, naturally (the locals wouldn’t dream of leaving the house mid afternoon.) 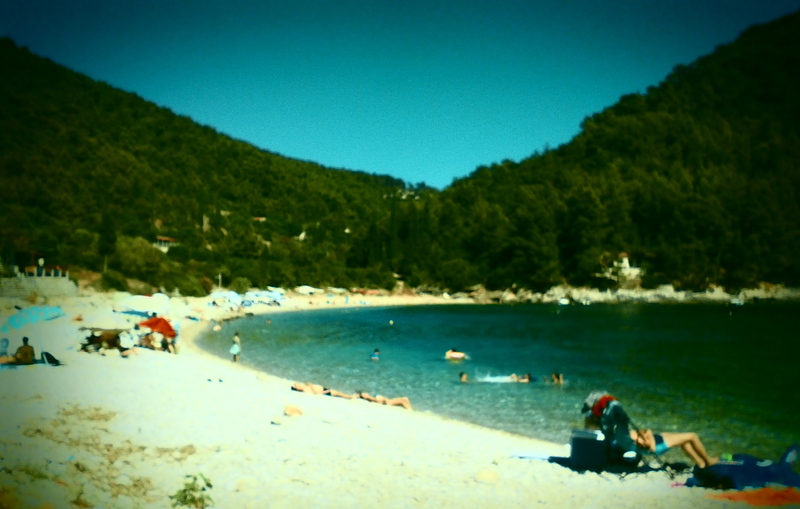 After cascading down a hairpin windy road, we reached the beach of all beaches, the local’s secret of Korcula. We headed down a secret garden kind of path to the glorious beach, aquamarine water sparkling in the bright, bright sun, this certainly was a paradise dreams were made of. We found a space, hit the water and explored the bay, swimming into wee coves and climbing up and down the rocks. As a keen swimmer, Croatia was an absolute wunderland. Every morning I’d set off on an exploratory mission. With bikini underneath and goggles in hand, I’d jog around the bays and find a cordoned swimming area, which are found all along the coast. There is something so invigorating about doing laps in the sea, surrounded by other keen swimmers and placid fish bobbing around in the waves. In Croatia, swimming is a part of everyday summer life – the men practically live in their speedos and more often than not, the teency, figure-hugging lycra is patriotically designed with the Croatian flag on, proudly for the world to see. After a long swim in the ocean, we were parched and in desperate need of refreshment. We headed to the beach watering hole ‘Club Mate’ and met the local lads. What is ironic is that the Club-Mate that I’m used to, is the famous carbonated yerba mate tea drink I practically live on when I’m in Berlin (along with half of the population there.) Club-Mate is derived from the leaves of the yerba mate tree native to South America. In its usual guise it is a hugely popular tea in Argentina and other parts of South America. However, in Germany and other parts of world lucky enough to have it, it’s a low sugar, highly stimulating and refreshing drink, which goes perfectly with vodka and an afternoon playing table tennis on the banks of the canal. Yerba mate contains a serious dose of antioxidants and is highly caffeinated, but without the usual jitters and crash that is associated with coffee. We sat down and had a natter with Mate, the proprietor, who occasionally got up to blow his whistle and entice those walking past to have a shot of rakia, the house distilled spirit not dissimilar to rocket fuel. In another ironic twist, it was Mate’s family restaurant we’d just visited and were booked in to later that night. We spent the afternoon there, drinking beers with Mate and his friends, who had helped build the beach shack and were making sure that it lasted the summer, by keeping a half-cut but ever watchful eye on the place. I thought it fitting to replicate Club-Mate, the drink, as an ode to our friend Mate and his kooky beach club. As Club-Mate is practically impossible to come by in New Zealand (one place sells it in Auckland) I’ve had to make it myself in order to indulge my addiction and I’m pretty damn pleased with the result. Steep the yerba mate leaves in boiling water for a few hours or overnight, along with the sliced lemon, vanilla (optional) and honey or agave. If you have a Soda Stream machine, add the desired measure of cold water and fizz it up. If you don’t have a Soda Stream machine, simply add the desired measure of soda water. Serve on its own with ice or as a mixer with vodka and prepare to dance all night long. * Yerba Mate is available at good health food stores and organic shops. I loved reading this excerpt!!! I felt as though I was there with you!!! I want to go and find Mate and have a drink with him !! I want to go back to Croatia!!! You have a great talent for writing and innovative foodie recipies!! Keep it up!!! You should send this recipe to a magazine!!! Wow, Em that sounds blissful!